Discussion in 'Manchester United Forum' started by charlenefan, Sep 26, 2018. A Pogbaless Manchester United looks like it may be a reality both in the short term and the long so how should we line up without him and how good would that line up be? We should make a thread for our Best XI without Mourinho since we are doing a thread for each. That's an extremely depressing line-up. That looks like a midtable team. That team will get us nowhere. Seriously? Pogba transforms it that much? Not so much the players but their positioning as well. Lingard on the right and Sanchez are number 10 is a big no. Valencia is finished. It's missing Fred, Fellaini and Bailey as well. Fellaini has to be in the team until someone better arrives. The only time we look like we have a plan is with Fellaini on the pitch so if he starts my thinking is we don't need Lukaku as much and it opens up a space for Sanchez to play uptop like he did for Arsenal. Although I think Valencia is currently better than Dalot I think Dalot delivers a better cross (from the little I've seen), something we will sorely need with any of our players on the right. 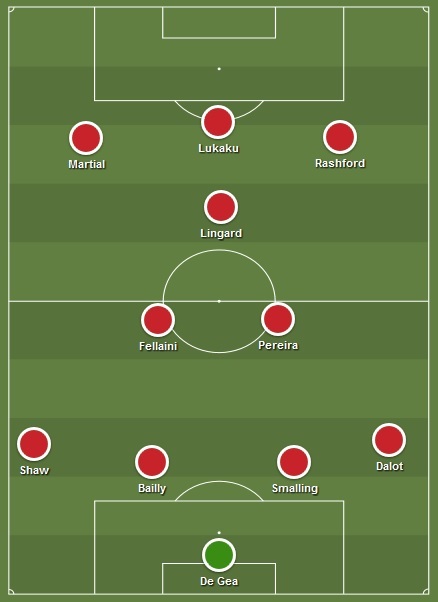 Could also change the front 3 to Lukaku - Rashford - Martial. Lukaku is our best crosser from the right, and Rashford is a horrible dribbler but has pace to get behind a defense. As expected it's slightly more depressing than a best 11 with Pogba in it. Midfield isn't creative enough, Lindelof needs improving and an actual RW needs to be brought in. If those changes were made and Dalot secures the RB spot to replace Valencia, it's not too bad on paper. Goes to show how much creativity we lose by removing Pogba. We struggle retaining the ball and initiate attacks as is...that all looks terrible. Pereira to stay more in midfield position and provides support for midfield with Rashford & Martial keep switching role to shuffle the opposition defense. I'm not a fans of Lukaku, so I'll take him out. With Dalot and Shaw contributing to attack, and Fellaini dropping back as 3rd central defender when needed. We have options. Things are not as terrible as people make them to be. Pereira is our only other attacking midfielder so he will need to play. Rest are the same. We won't be selling Pogba before getting one or two players to replace him in the same window. Thank feck you're not the manager then. To play a midfield 3 without Pogba is extremely stupid. Name me a top team that only attacks with 3 players. Barcelona only do it because they have Messi. Pereira can play as a right wing, surely better than mata and lingard there. 442 without pogba is where we should go. Our creativity is bad enough at the best of times, imagine it without Pogba. These lineups are tragic. I can see the difference between a world class striker and Lukaku. Considering he’s our only creative spark compared to hoof ball to Fellaini. Yes! Sevilla showed us that. Barcelona do attack with Four. I will name Madrid, Liverpool, Chelsea and Juve to an extent. People have to remember that Jose is still the manager and the boss. Put Sanchez and Martial as strikers and Pereira beside Fred and I will love this. True but we never play direct to him when he starts. We try to make him play as this controlling midfielder and he's always too slow for this. Just play to our strengths from the start and think of another plan B. Hoofing to Fellaini as much as we hate it is our biggest strength. Fred played in a double pivot at points for Shaktar I believe, and Matic has played one with Kante, so neither would need much time at all to be comfortable in the Role. Rashford, Pereira, Mata, Martial etc are all comfortable playing in their positions. Fred will be pretty pivotal, as he is great at breaking the lines which will make us more creative hopefully. In the next transfer window we still really need that talisman attacker, someone Cantona/Ronaldo/Rooney level. Players like these mask deficiencies in the squad, whereas some of our forwards at the moment seem to highlight them. Right now given Sanchez has been awful and Matic is moving like an oil tanker, I'd probably say this is the best, you could interchange Fred for Pereira but I think the latter is a better passer and we'd need that without Pogba in the 11. Truth is though any 11 without Pogba is a mid table team, with him we barely look like a top 4 side at the moment. Pogba isnt going to play at all? We are going to sell Pogba and not get a replacement? I would like to think that the board are not so inept to sell Pogba and not get a top midfielder in since he'll fetch a pretty penny. An intelligent 442 diamond with tactical discipline and tactical awareness they say. Yep. And players running through brick walls.